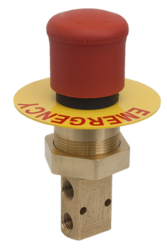 The Versa E-Stop valve is designed for pneumatic systems that require an emergency stop function. By pushing the knob attached to the Versa 3-Way Normally Closed B Series valve, the source air is blocked and the system air is vented to atmosphere. 3-Way Normally Open also available. The knob uses an electrical E-Stop twist and lock feature that prevents the valve from returning to the de-energized state until it is manually reset. The B Series E-Stop is an ideal solution for an all pneumatic systems. 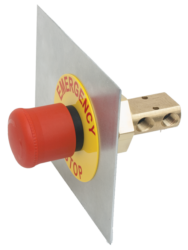 In systems where a pneumatic circuit is preferred over electrical, such as hazardous environment, the B Series E-Stop is the perfect safety solution. The control valve is based on Versa’s B Series brass valve which is field proven with years of reliable service in push button applications. For ease of installation, the valve body may be rotated 360 degrees and has a choice of three inlet port locations.